Left: 700mm internal, Right: 1000mm internal. The oven is 900 mm dia x 350 mm high with an internal measurement of 650 mm dia , hand made in South Australia. The unit is constructed from specially design dense refractory concrete and reinforced with stainless steel reinforcing needles and galvanized mesh. This reduces fractures from thermal stress and adds to a longer oven life. The efficient design and extensive insulation used makes this oven easy to operate, with it ready to cook delicious pizzas in approx 45 minutes. It cooks unbelievable roasts. With a large door opening to take a medium camp oven it also to the ambience of the night to see the fire in the oven. 850MM dia x 54mm thick refractory base which the oven is built on. 55mm thick in dense concrete to hold heat for baking, giving this oven one of thickest hearth available. Two half dome sections in 50mm refractory concrete. This is built in two sections to reduce thermal expansion stress. 50 mm of ridged insulation. Insulated timber door and handle to reduce any chance of being burnt. 150 mm stainless steel flue 900 mm long. 150 mm stainless steel, specially designed flue cap to reduce blow back. This oven weighs approx 300 kg and requires special care when moving. The oven is 9000mm dia x 500 mm high with an internal measurement of 700 mm dia , hand made in South Australia. The unit is constructed from specially design dense refractory concrete. It is also reinforced stainless steel reinforcing needles and galvanized steel mesh. This reduces fractures from thermal stress and adds to a longer oven life. The efficient design and extensive insulation used makes this oven easy to operate, with it ready to cook delicious pizzas in approx 45 minutes. It cooks unbelievable roasts. With a large door opening to take a large camp oven it also to the ambience of the night to see the fire in the oven. 900 mm dia x 54 mm thick refractory base which the oven is built on. 4 x 32 mm replaceable molded refractory hearth sections. This brings the heart up to 86 mm thick in dense concrete to hold heat for baking, giving this oven one of thickest hearth available. Two half dome sections in 50 mm refractory concrete. This is built in two sections to reduce thermal expansion stress. 13 mm of high temperature insulation. NOT CERAMIC. A layer of mesh on top of the insulation then 37 mm of ridged insulation and reinforced with alkaline resistant fiberglass . This oven weighs approx 240 kg and requires special care when moving. A galvanized frame on casters, 1200 mm x 1200 mm x 1100 high in 50 mm x 1.6 mm thick and with heble top to suit oven is available for the 650 mm and the 700 mm ovens. 1000 mm INTERNAL D. I. Y. 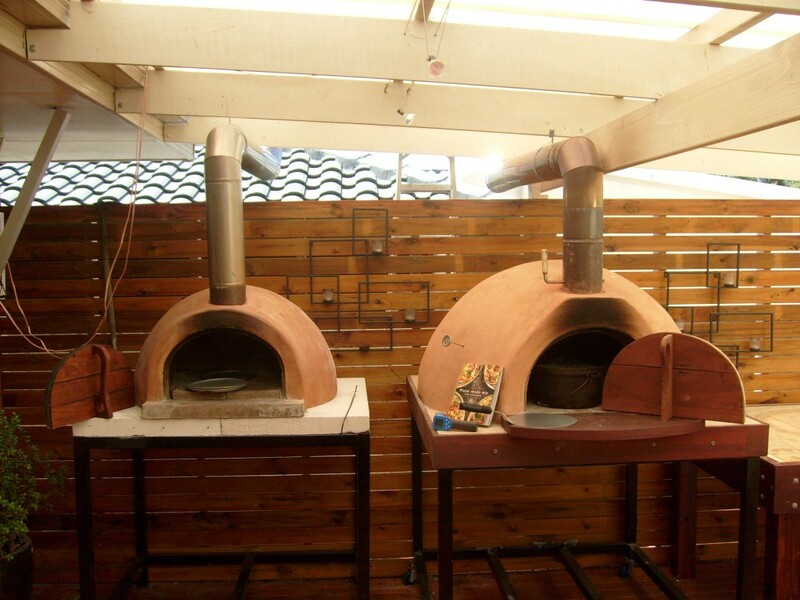 The 1000 mm internal wood fired pizza oven is a D. I. Y. Kit . It is constructed from specially designed dense refractory concrete. They are reinforced with stainless steel reinforcing needles and galvanized steel mesh. This reduces fractures from thermal stress and ensures a longer oven life. Pre-cast front door entry hearth. 150 mm stainless steel damper.